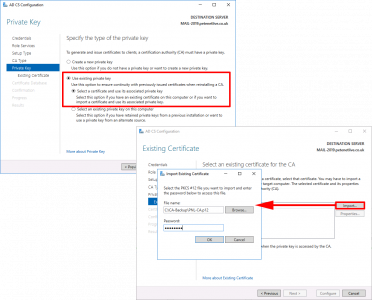 If you are retiring a CA Server, or there sa problem with the server and you want to move Microsoft Certificate eServices to another server, the procedure is pretty straight forward. BE AWARE: We are moving the CA Server, NOT the server name/FQDN, the two things are NOT the same, (you might have called them the same thing!) But a Certificate Authority has a name of its own, and that what we are going to move. So the new server doesn’t have to have the same name? No, it can do if you really want, but that’s an added layer of complication I cant see the point of? 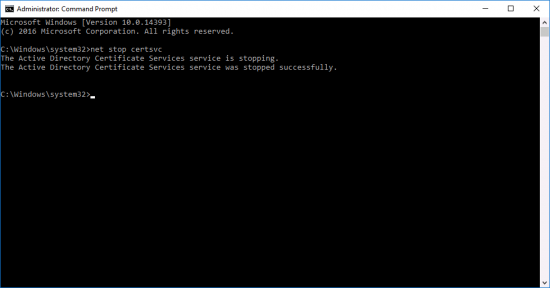 Here I’m moving from Server 2016 to Server 2016, but the process is pretty much identical all the way back to Server 2003. 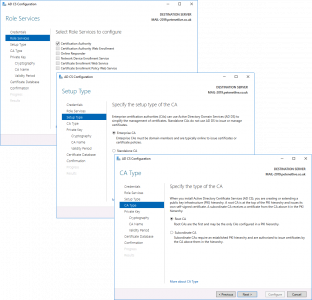 On the ‘Source‘ server, open the Certificate Services management console > Right click the CA NAME > All Tasks > Back up CA. 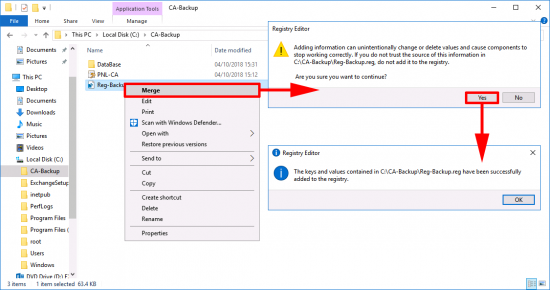 The backup wizard will open, Next > Tick BOTH options > Select a Backup Location > Next > Set a password (you will need this to set the new CA up!) > Next > Finish. Export a copy of this key, (save it in the same folder that you backed up to earlier). Now we need to uninstall CA Services from this server. 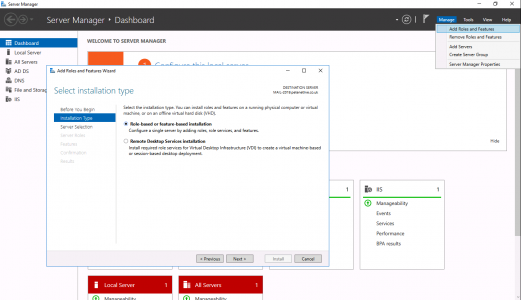 Server Manager > Manage > Remove Roles and Services > Next. REMOVE all the CA role services first! 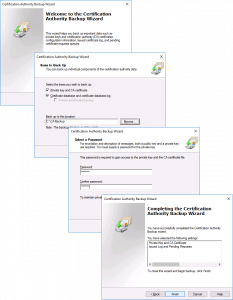 > Complete the Wizard, then launch the wizard again and select ‘Active Directory Certificate Services > At the pop-up select ‘Remove Features” > Next. Next > Next > Next > Close. 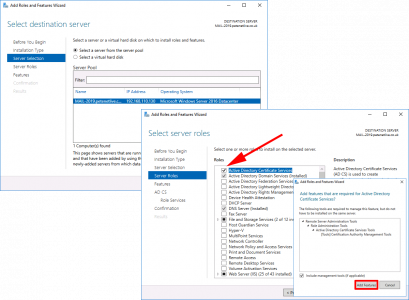 Server Manager > Add Roles and Features > Next. 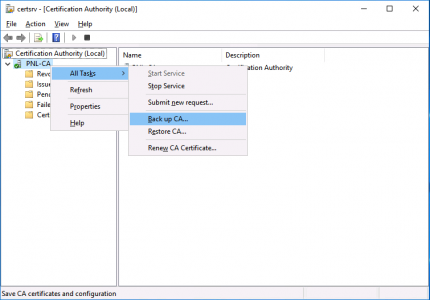 Next > Select ‘Active Directory Certificate Services’ > Add Features > Next. 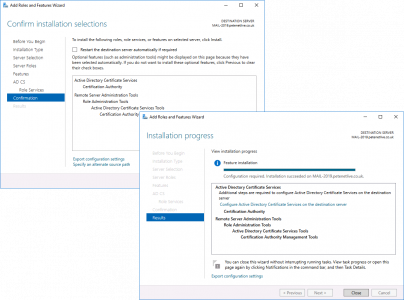 For now let’s just stick the Certification Authority > Add the other role services later* > Next. 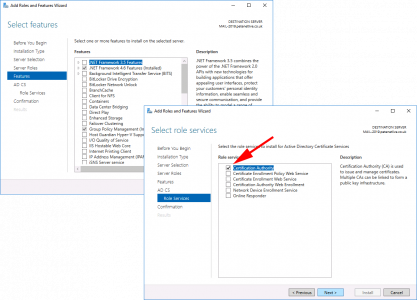 *Note: I’ve written about all these role services before, just use the search function, (above.) If you are unsure what they all do. 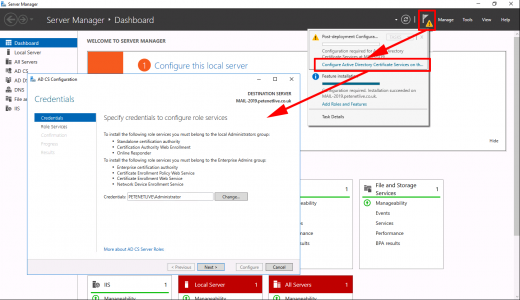 Warning > Configure Active Directory Certificate Services > Next. 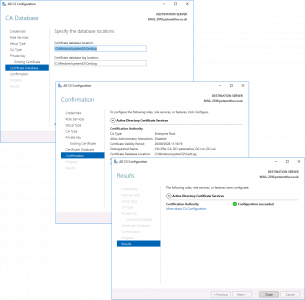 Next > Enterprise CA (Unless it’s an offline non domain joined CA) > Root CA (unless it’s a subordinate CA!) > Next. > Select ‘Use existing private key‘ > Select ‘Select a Certificate and use its associated private key‘ > Next > Browse > In your backup folder locate the certificate (it will have a .p7b extension.) > Enter the password > OK > Select the Cert > Next. Next > Next > Configure > Close. 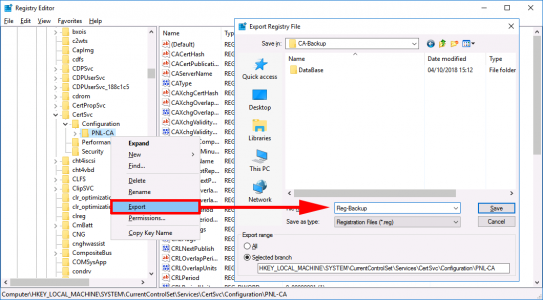 If your new server has a different hostname/FQDN open the registry file you exported above with Notepad, Locate and change the CAServerName entry to the name of the NEW server. 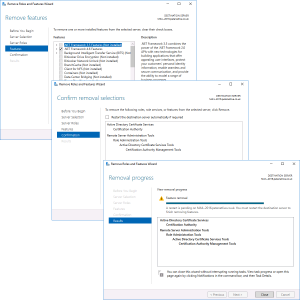 Right click the registry backup > Merge > Yes > OK. 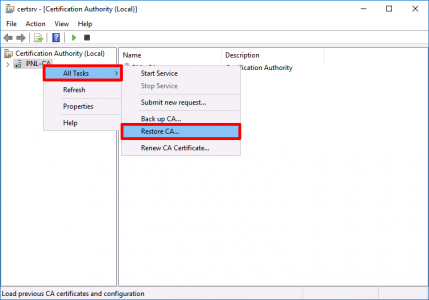 Launch the Certificate Services management console > Right Click the CA NAME > All Tasks > Restore CA. 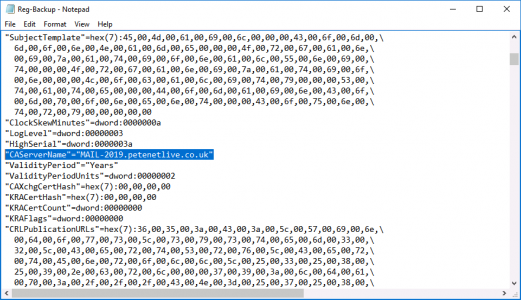 The restore wizard will start > Next > Browse to the folder with your backup in > Next > Enter the password you used (above) > Next > Finish. You will be prompted to start the Certificate Services service > Yes. 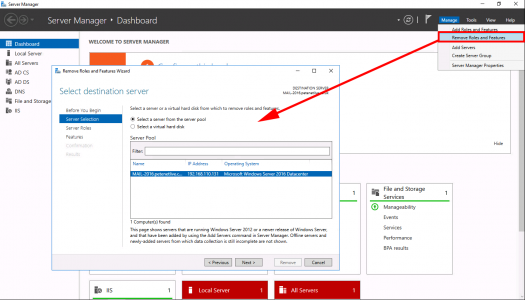 Thank you for submitting the new hostname CA server Fix.